At a pre-Open tournament last week in Sydney, the Argentine-Armenian beat the American-Armenian..
Five tennis players of Armenian heritage entered the Australian Open, the ATP's first Grand Slam of the new season, in Melbourne. Two remain in singles competition: Andre Agassi (USA, seeded 4) defeated Tomas Enqvist (Sweden) 6-0, 6-3, 6-3 to advance to Round of 16. David Nalbandian (Argentina, 8) will get his chance to advance tomorrow when he meets Wayne Ferreira. All three in the men's division men advanced to the second round. 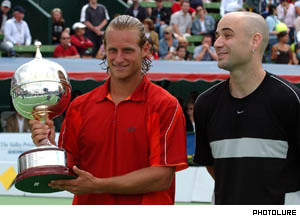 Agassi (United States, seeded 4) defeated Todd Larkham (Australia) 6-1, 6-3, 6-4; Nalbandian defeated Ricardo Mello (Brazil) 6-2, 6-1, 6-4; and Sargis Sargsyan (Armenia, unseeded) defeated Jonas Bjorkman (Sweden, 25) 6-2, 6-3, 6-1. Agassi (6-0, 6-2, 6-4 over Tomas Berdych of Czech Republic) and Nalbandian (6-1, 6-0, 6-3 over Florian Mayer of Germany) advanced to the third round. Sargsyan, however, was knocked out by Todd Reid (Australia) 3-6, 4-6, 6-4, 7(8)-6(6), 4-6. Sargsyan earned $28,000 and 7 race points. (Sargsyan teamed with Karsten Braasch of Germany for a Men's Doubles second-round victory Friday). In the women's division, Marie-Gayane Mikaelian (unseeded) of Switzerland suffered 0-6, 1-4 /retired/ defeat in the first round against Tatiana Golovin of France (unseeded). Magdalena Maleeva (Bulgaria, whose mother is Armenian) lost a second round match to Petra Mandula of Hungary, 7(8)-6(6), 2-6, 3-6. Maleeva is still alive in third round of Women's Doubles, with her partner Conchita Martinez of Spain. Winner of the 2003 Armenian season FC Pyunic lost the possibility for continuing its participation at the CIS Cup competition started on January 17 in Moscow, where winners of the local leagues of all 15 former Soviet republics and Russian U-19 teams are fighting for the cup. Pyunic lost its first two matches, to Dinamo Kiev (Ukraine) and Flora (Estona). It won against Nisa (Turkmenistan), but was already disqualified from advancing. The recently renovated Opera House hosted a ballet performance based on Aram Khachatryan's "Concert for Violin" last weekend. It was the first time the piece has been accompanied by dance.